Looking for a great trunk organizer to restore order to your car? Tired of the chaos that seems to creep into your vehicle over time? We found the best selling trunk organizers in 2018 and share our top picks for every type of traveler. Whether you are a busy mom taking the kids back and forth to school, an avid golfer with lots of gear to bring along or the everyday person like me who needs to keep their groceries from spilling all over the back seat. We found the best trunk organizers in every category, compared the top sellers and reviewed their most important features to help find the best fit for every lifestyle. Car “trunk” organizers can be used anywhere in the car. Before we dive into the list, not every is familiar with this product, so we wanted to briefly clarify one point. Just because it’s called a “trunk” organizer – doesn’t necessarily mean it will go in your trunk! Many people use them in the front or backseat or the cargo area of an SUV, so don’t worry too much about the name – it’s just a catch all term used in the auto accessories market. But for sure – almost everybody can use one of these handy items, and if for any reason you aren’t convinced, just check out our top 10 ways to use them on our blog. However, this is one product where one size doesn’t fit all, so we break down the best car trunk organizer for every lifestyle and budget. Here is a quick chart to compare the size, weight, price and best use for each car trunk organizer that made our list. Pay special attention to the weight as this is a good indicator of the quality/strength of the product. You will aslo note that the price goes up as the quality does as with most purchases, you get what you pay for :). 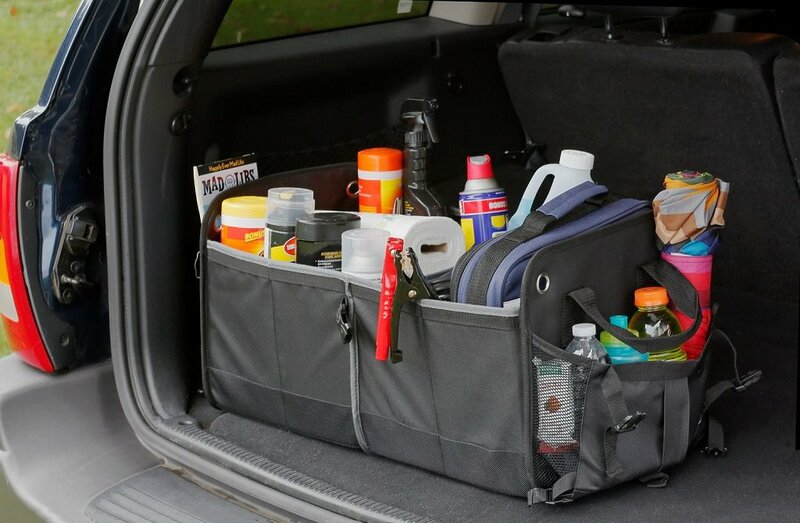 Drive Auto Products makes our favorite organizer for SUVs and off-road vehicles. Superb quality materials and an cutting edge design earned this product the top spot in our list. The company has been featured on shows like HGTV and the DIY Network. In 2017, they partnered with NASCAR during their 2017 race day program and received an endorsement on one of their related products from Kevin Harrington who is one of the original sharks from the TV show Shark Tank. What makes this our top pick for the SUV? One of the deciding factors was the tie down strap which can be attached to the anchor points in the cargo area. This feature is especially helpful to keep the organizer from sliding or tipping over when you take those sharper turns or head into rougher terrain. Read more about this product and check out the pros and cons in our detailed review. Anyone who does a bit of grocery shopping has lost an orange or two after the groceries bags have spilled out into their car on the way home. We have tested the HomePro Goods trunk organizer for grocery bags and found this to be one of the best picks for the shopper of the family. 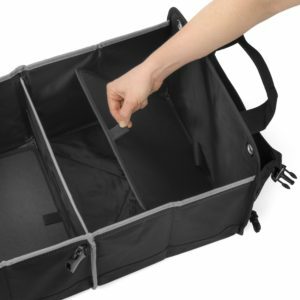 A few of the deciding factors for choosing this product were the size of the two main compartments and the heavy-duty construction that keeps the organizer upright even when it’s empty. There are a few similar products in this same category, but we choose the HomePro Goods brand since it has received consistently good reviews and is offered a reasonable price point when compared to the other brands. As a bonus, the company has a coupon for a free reusable cotton shopping bag with every purchase, and I love a good coupon! See more in our detailed review about the HomePro Goods grocery trunk organizer. 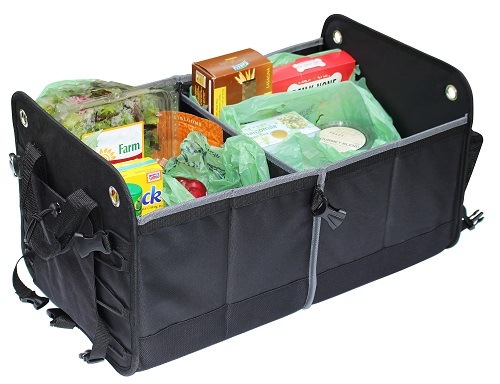 Our second choice in the grocery and shopping category is the Premium Heavy Duty Auto Trunk Organizer by Tidy Globe. The Tidy Globe brand has many of the same features as the HomePro Goods organizer, but it is also available in other colors, their most popular color by far is red. The company offers a lifetime guarantee on their products and have had a long time favorable review history from many of their customers. As you can see from the photo to the right, you can pack alot of goodies in theses organizers! If you travel any distance to the grocery store, we recommend choosing a trunk organizer with a cooler. I was impressed with the Tuff Viking 3 in 1 convertible trunk organizer. 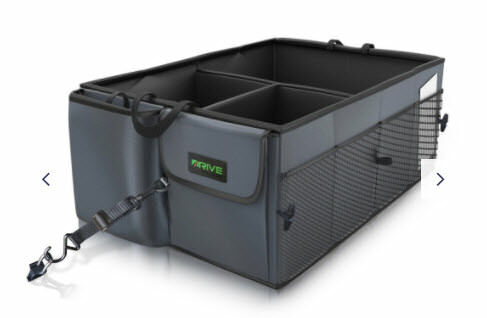 The 3 in 1 refers to the adjustable sizes – you can configure the organizer to use one, two or three compartments depending on the amount of storage you need on your trip. This is one of the larger organizers on our list at almost 3 feet long when fully extended. The cooler section is also removable which makes it easy to take inside or use it as a travel cooler. 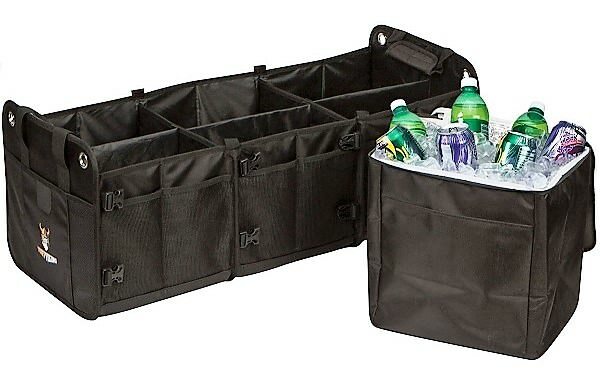 Our second choice in the keeping it cool category is the AutoArk Multi-Compartment Organizer and Cooler Set. The AutoArk brand offers larger families an affordable option while still providing some great features. As the time of this article, the price was just under $15. 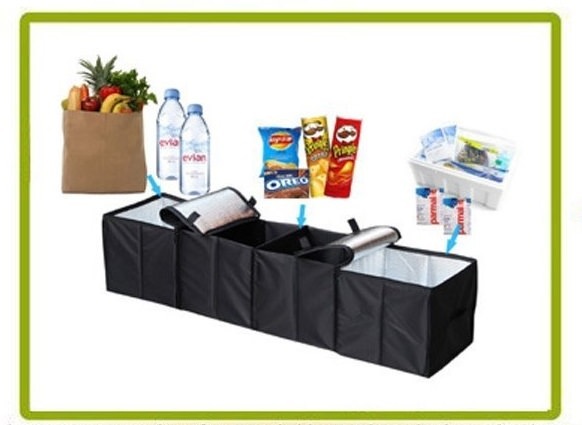 It’s a whopping 45 inches long with two cooler compartments (four compartments in total) giving you plenty of room to fit all your grocery bags. The insulated sections can keep food warm as well as cold, so it can be used for bringing hot appetizers or side dishes to a party. When not in use, you can fold it up quickly and tuck it away until you need it. 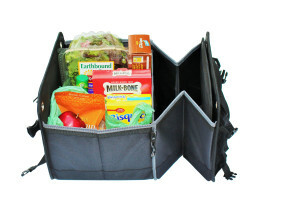 I should mention however that with the lower price point, this organizer is not as strong as many of the other organizers on our list, so isn’t intended to be portable, but it will still help keep your groceries hot or cold while in the car. One of the big reasons most moms are on the hunt for a good car organizer is to keep the kids happy during the never-ending activities, carpools, and outings that grade-school-age children seem to have. 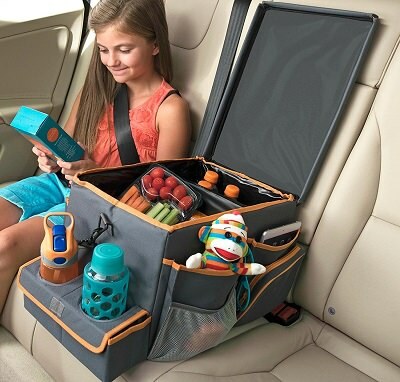 A great organizer to keep the kiddos occupied is the High Road Kids Car Seat Cooler with Snack and Play Tray. What makes this product different than so many others on the market is the convertible flip-top lid. It also includes a carry strap, cup holders and side pockets for a unique very child-friendly design. Don’t miss our detailed product review on this brand – coming soon! 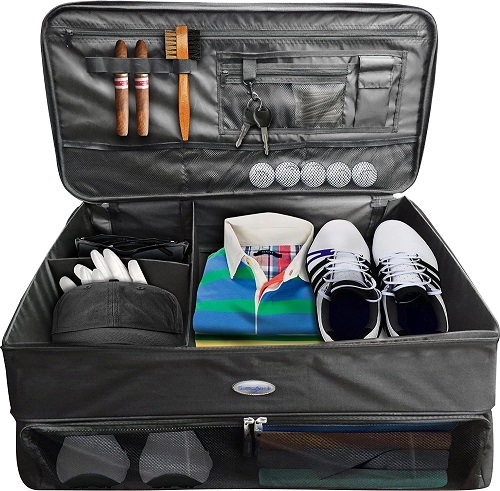 A good golf trunk organizer is a must-have for the golfer in the family. Between the golf balls, tees, gloves, and shoes there are just too many smaller accessories used in this sport not to have an organized solution in place to keep it all together. Adjustable compartments in the top section for gloves and tees or snacks. Plenty of smaller loops, zippers, and pockets right in the lid of the organizer for easy access. A ventilated mesh front section so you can easily see inside and to let your shoes “breathe” a bit. See our article on the Top 5 Golf Organizers for more information and our other selections for the golfer. 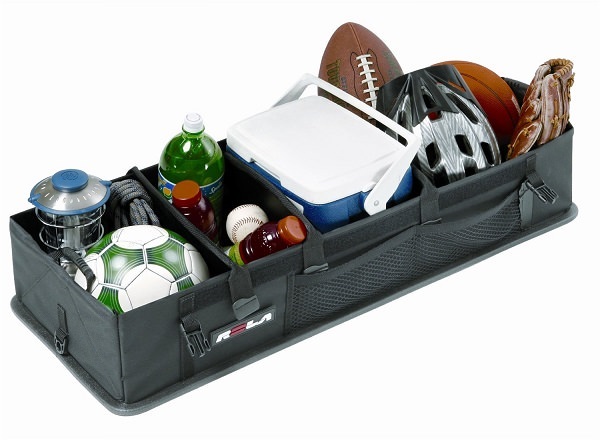 If you have any sports fans in the family, you will probably want a heavier duty organizer with a sturdy base. 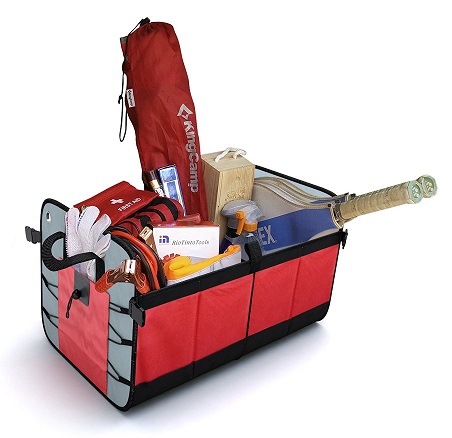 Nothing beats the Rola Trunk Organizer in this category to keep all your sports gear in check. The ROLA brand has been Australia’s premier vehicle outfitter for over twenty years. They make some of the highest quality products in the automotive accessory niche and are very well respected in their field. The MOVE (Mobile Organizational Vehicle Equipment) Rigid base organizer has a unique spring-loaded system that opens easily from it’s folded size. The interior compartments are adjustable so you can place them exactly where they are needed to keep your items secure. The Rola 59001 also boasts mesh outer pockets, carry handles and non-slip materials for a well-thought-out design. If you have never tried using a trunk organizer, you may want to opt for a DIY solution to see what the fuss is all about. One of the best ideas I’ve seen is to use a simple plastic laundry basket in the car to keep your items in place. The laundry basket may slide around a bit, but a little double-stick tape placed it on the bottom of the basket will fix that right up for you. This is also a great way to clean up your car if it’s gotten a bit out of control. 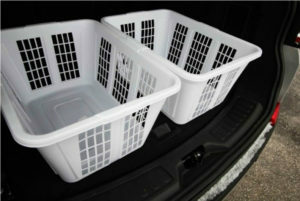 A laundry basket is the perfect size to carry things in and out of the car during the car organization project. Check out our article on Homemade Organizers for more DIY tips. 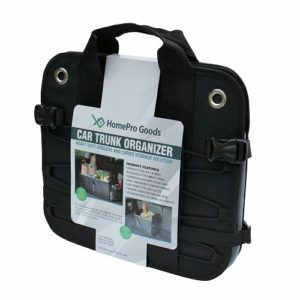 Our favorite organizer for cars, trucks or SUVs is the Heavy Duty Trunk Organizer by HomePro Goods. The materials are top notch, the price is right and it’s super strong and adjustable to boot. We also liked the fact that is was not only adjustable – but there were thick buckles to secure the smaller size. No other product had the same quality hardware. This is obvious when looking at it folded, just like a small briefcase that makes it so simple to take with you. It’s a large trunk organizer that can easily be converted to travel size. There were a few runners up – Rola makes a great product, but we didn’t like the fact that it folds flat down to the bottom creating a larger footprint. Busy Life was another option – but we just didn’t like the look of it quite as much, the silver is a little off-putting. The HomePro Goods trunk and cargo organizer also had amazing reviews, which is the true test of the finding the best trunk organizer. If the customers who use the product on a daily basis are happy, chances are very likely that you will be too! Click here to see for yourself on Amazon.com. What are the Important Qualities of a Great Trunk Organizer? Here are a few things you should check before you buy. 1. Is it Sturdy and Durable? A good trunk organizer should last a long time. There are plenty of cheap models out there that fold in on themselves when they are empty. How frustrating is that? You have an armful of groceries & open your trunk only to find a floppy piece of polyester. A great trunk organizer should stand up on its own. You also should look take a close look at the materials. Inspect the outside, the lining, and the hardware. The material should be thick enough to withstand getting knocked around a bit, and the lining should be moisture resistant. The hardware should also be thick of good quality plastic and/or metal. If you are shopping online and don’t have the option to feel the materials, you can also check the weight of the product. Compare this to similiar products in the same size and price range, then pick the one that weighs the most. Quality materials typically weigh more than their cheaper counterparts. When you don’t need the extra storage in your car or truck, you don’t want to be stuck finding a place to store the organizer. A really great trunk organizer will fold down to a small size, so it isn’t in the way. Here is an example of a product that folds down perfectly with strong plastic clasps on both sides as well as on the bottom to be sure it stays true to its compact form. The handles even come together to form a little briefcase making it easy to take with you. A smartly designed car organizer will be adjustable. Our needs may change from day to day & where you might need a full-size organizer one day; you could only need a small car organizer the next. Having an adjustable organizer is a great way to use only the space you need. Take a look at the folding trunk organizer to the right. It has two main compartments, one of which can be collapsed when you don’t need the extra space. Snap the buckles to the middle clasp to create a sturdy one section grocery holder. When you need the extra storage, just unclasp the buckles. 4. How Many Pockets or Dividers are there? If you are storing different types of items, it’s nice to have at least one divider to help keep your belonging upright and also to separate things like groceries from sports equipment. Pockets are a great feature to have to keep things separate and organized. At a minimum, there should be a few outer pockets so you can store everyday items like tissues, snacks or water bottles. Inner pockets are also a bonus. The number of dividers and pockets may be an individual choice depending on how large the items are you need to keep. 5. What is the Size? Size is a huge factor when it comes to selecting the best trunk organizer. Have a look inside your car and decide where it makes sense to place the organizer. Will it be inside the trunk of a compact car or in the bed of your truck? Then measure the space to see what will make sense for your particular vehicle. 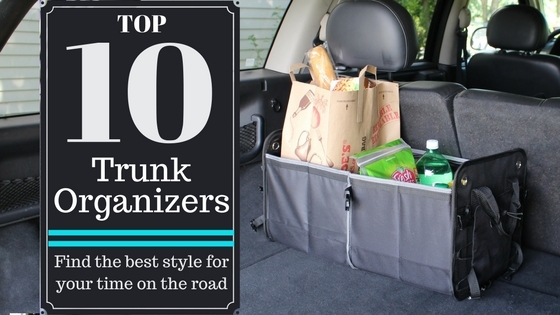 If you don’t spend too much time in your car, you may do well with just a backseat organizer. The type that hooks over the backseat of your car. Or if you plan on using it to store groceries for a family of 6, you might want something a little bigger. When planning a family road trip, you may want even more cargo storage space in your car to hold larger sports gear such as bikes and skis. In this case, you might want to add a roof or hitch rack to your vehicle. We spend a great amount of time in our cars. Whether it’s transporting the kids to and from school, going to the grocery store or meeting your friends for a dinner party. All of these things require we keep a few important things in our cars. The more time you spend running around town, the more things you will find that accumulate in your car. A car trunk organizer is a perfect way to keep all of the little items we need to travel within a single convenient location. Our personal organization is just as important in the car as it is in our homes. It keeps us efficient and puts your best foot forward as you head out into the rat race every morning. Looking for the best way to organize your car, truck or SUV? We'll help you find the perfect car trunk organizer to make your time on the road easier. Do you need a car organizer to keep the kids busy, a place to store your golf gear or contain grocery bags? See our top picks for each category.